On Monday, I thought (for sure!) I'd be finished with the leafy vine scarf on Tuesday. Here it Saturday, and –um, well it's almost done! See—here, when last seen --the tails of the right side? 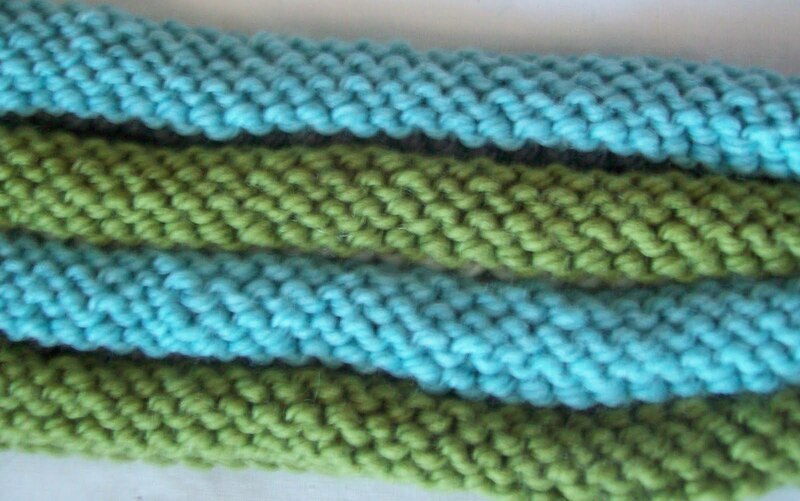 The right side image was close to the start of ball 3—and look where the yarn tails are now (on the left side image) Much further from the needle! Not far enough, but definitely further. Actually I am on the last pattern repeat –Row 16 (of 32) on the last repeat (the 4th) of this skein. I was able to knit about (not quite) 4.5 repeats with skein 1. I want to end the scarf with a full repeat of the pattern, and not with just half a leaf knit. I'd rather have a bit of left over yarn than not have enough yarn, and have to frog. So 16 more pattern rows, and a few rows of garter as an edging, and the knitting will be done. The finished unblocked scarf will be about 64 inches long- A rather long scarf! Then comes Part 2 of the work—weaving in (easy enough) and blocking—the hard part of blocking will be finding a long flat space! (likely the couch) But I have blocking wires (a big help!) and the pattern has, on the side, a lace and garter treatment. The wires will be threaded into the column of lace and it will be pretty quick to pin out. The reason I haven't made more progress? 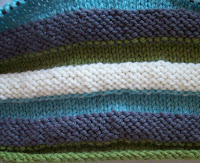 Green, grey, blue, white.. (repeat) 6 Rounds of each color, stocking knit and reverse. 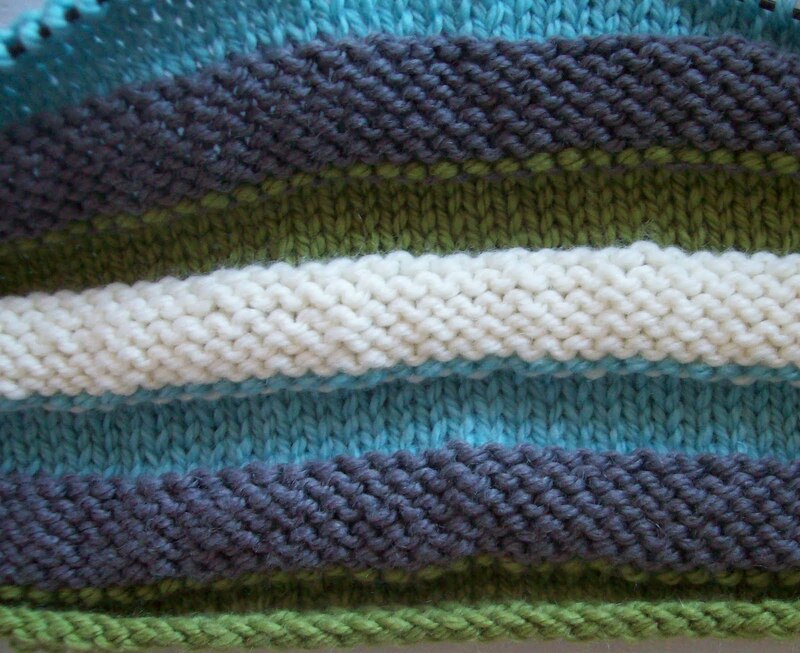 A loop of about 40 inches, loosely knit on the recommended size 8 (5mm) needles. Soft and cushy—what else would expect from a blend of Merino and Cashmere? 1 ball of each color will be enough for 2 repeats of the color way, --but I have 2 balls of each color, and will get at least 4 repeats -about 8 inches bunched up—twice that stretched out,--as it might be pulled over the head and twisted round the neck, or twisted and wrapped turban like round the head. I like how, not stretched, one side is Slate and Snow, and the other sides is Water and Grassland.. The second one is less important –it's for my DD's current boyfriend –and the default gift is a hat.. Often a nice one, (wool) but really nothing special. (Stash yarn, and a pattern I want to knit—because it interests me. But not a hat I am not interested enough to want to own it. Likely I won't actually see him Christmas day --and will have a few days after the actual holiday to finish up if needed. But hats are quick to knit, and the yarn is thick and will work up fast. I have some blue tweedy sort of yarn--2 skeins of Beatrice in a blue and brown color way. The color is masculine, the price is right. The yarn was gifted to me, so not only is it stash, its free (to me) yarn--just the right amount to spend on a boy friend who may (or may not) be here next year. With the bonus--MORE yarn gets knit up and out of the house! Labels: leaves on the vine, Welted wimple. I really like how the unstretched Welted Wimple different colors on each side. 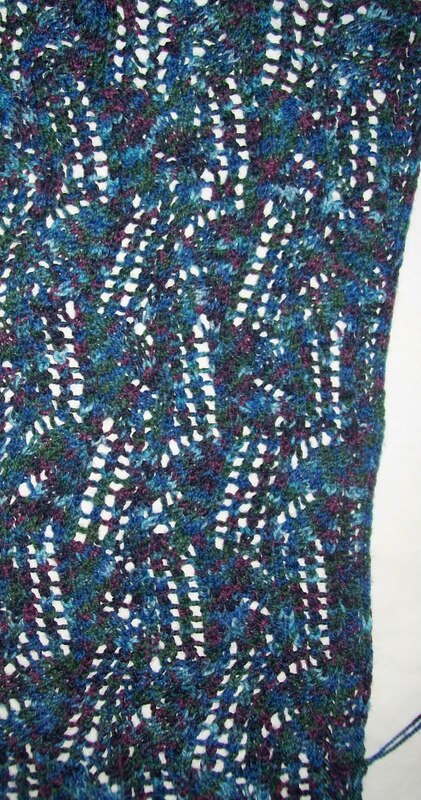 Also love how the leafy vines scarf is going to be really long--for me, a scarf can't really be too long. The longer, the better!